We looked for a listing with Heinrich Dannemann from Tungeln who had written his parents on August 10, 1851 from New Buffalo/Indiana stating that he had arrived in New York on August 4 at 6 A. M. "It was a huge forest of masts facing us. For here at anchor lay ships compared to which ours was but a boat. Sailing-, steam- and battle ships lay intermixed with each other so that the eye could not encompass the view" (Wolfgang Buesing, "Der Amerika-Auswanderer Heinrich Dannemann (1832-1852) und seine Familie in Oldenburg”, in Oldenburgische Familienkunde 43 (2001), 1: 291-307: http://www.genealogy.net/gene/vereine/OGF). Our search for the name and passenger list of the ship which at 4 PM on June 21, 1851 sailed forth from the dock, "coming finally into the Weser River with sails unfurled and compass oriented", gets no mention at all in the tripartite data base of Germans to America. Thus the German Emigrant Database in Bremerhaven (Deutsche Auswanderer-Datenbank: DAD) knows nothing about the emigrants, while the available information from the "http://www.familytreemaker.com” and its CD "Germans to America 1850-1874”, also shows up in the negative while the book edition likewise shows up with suspicious gaps: In Volume 2 (Glazier / Filby, Germans to America. Wilmington/Delaware: Scholarly Resources 1988, pp. 92 ff. ), it appears between July 19 and September 20, 1851. Was the original lost or did the Glazier / Filby team misplace the list in evaluating which to include from the available heap of originals? Had the originals disappeared and had they nevertheless been filmed before? If we just look at the same selection criteria for example from July 10-18, 1851 there are 13 ships missing which arrived in New York; taking the period from September 23 to October 9, the GTA team missed 23 ships. It means that they left out some 7,200 persons in this one incident. But if we consider the entire three month span of time, then there about 24,000-25,000 passengers with their 122 ships are missing. Thus e. g. from the Fides arriving on October 6, 1851 are missing the following individuals Friderike Schimmelpfennig (40) and Caroline Vollmer (22), Wilhelm Rottmann (30) and Wilhelm Spriethoff (27),missing from the CD, from the book edition, and from the DAD held in Bremerhaven; and during this span of time 4 ships coming from Bremen and arriving at Baltimore. Back to Heinrich Dannemann. Five ship lists from Bremen report the dates of August 4 and 5, 1851. On one of them, the Stephani (August 5, 1851), we find Hinrich Dannemann who was 19 years old, a farmer from Oldenburg with a destination "Milwaukie" who carried "two boxes," as his travel luggage. Other Oldenburgers traveling with him were Diederich (15), Hermann (25), Hinrich (16), Gerhard (18) and Margarethe Naber (18), Carl (19) and Heinrich (16) Budenbusch as well as Hermann Hinrich Meyerholtz (19), Johan (30) and Margarethe (22) Struwe; others were Gerhard Haas (28), Johann Grummer (28), and Johann Hinrich Rö. . . (19) and 11 others on the lists of the 226 passengers the captain had taken on board. The name of the woman who died on July 18, 1851 is entered as Auguste Amalia Kreil (34) from Prussia who had left behind her children Mathilde (6), Karl (5) and Louis (3). She had intended “to follow her husband with their three children to New York but during the night she got caught in a sail cloth and was thrown overboard. We had no other dead," Heinrich Dannemann noted. About 500 persons emigrating in 1852 from the communities of Liesenich, Altstrimmig, Mittelstrimmig, Grenderich and Sennheim with fares paid by the state [auf Staatskosten] settled in the United States. (Letters from Arnold Gossler of Liesenich to the author.) Reaching New York from Liverpool on the Henry Clay on July 13, 1852 and on the Oregon on July 17, 1852, the German passengers of the Oregon were recognized by the book edition Volume 3, the CD and the DAD but those on the Henry Clay were ignored: for example Stephen Ecken (Stefan Ecker) Peter Engles (Engels) or Pet. Jos. Frangen (Franzen). Without the original microfilms (M 237, Roll 116), documentation of this undertaking would remain totally incomplete. between 1850 and 1874. On the CD she can be found having originated at Bramkamp, but without any port of arrival, without any date of arrival and without any name of a ship. If we check the book edition we find in Volume 18 that she arrived on board the New York from Bremen to New York on June 25, 1866, but without any hometown. The original confirms that her place of origin was Bramkamp (M 237, Roll 268) which facts the DAD also registers, knowing also the harbor, the name of the ship and the date of arrival. The CD also robs 40-year-old Amalie Bien of her ship name, port and date of arrival but grants her what the original reports as her hometown, Wiesbaden. On the other hand, in the DAD and on the CD as well as in the book edition, Henriette (19) and Esther (20) Bann are fed a bill of goods with residence in Westphalia even though the original microfilm in clear writing offers the hometown as Nordheim. as arriving in Baltimore on June 1, 1850 on board the Ocean. Yet on the microfilm (M255, Roll 8) we find that his arrival was on August 9, 1850. The CD picks Heim up twice, once coming from Hetzelsdorf and in another place as originating in Germany. In the former case he remains in the U. S., but in the latter there is no mention of where he goes. In the former he has a ship's captain, in the latter none, in the former he travels in steerage but in the latter somewhere else, in the former he arrives any old place, in the latter he reaches Baltimore. In the former he has an IDS number 00015002 and in the latter 5002. Similar haphazard listing happens to most passengers, e. g. Minna Fahlbusch, Johannes Althoff, Hermann Hirschbert, Barbara Meister, but not e. g. Jacob Seeger, Johannes Betz and Doris Polgemeyer. The DAD does know their places of origin, the captain, the travel class, the ports of departure and arrival. However, the German Emigrant Database sticks with the wrong date of arrival, June 1, 1850. Still another case involved the Lethert family consisting of ten persons. The only thing known is that they arrived in New York on March 27, 1867 but we seek them in vain on the CD, in the book edition (Volume 19) and in the German Emigrant Database, the DAD. However the microfilm lists of the original passenger lists (237, Roll 277) can help us find them. Johann, Anna, Catharina, Gertrud, Maria, Anna, Carl, Margaretha, Engelbert and Heinrich Lethert actually traveled from Liverpool to New York on board the steam ship Chicago. It is true they were erroneously given the family name spelling of "Lithbut" but with the annotation that they were "foreign." Seventy-one Germans and three Frenchmen were registered on the last page under the rubric "the country to which they severally belong." But all three editions of Germans to America ignore these 74 passengers. On October 25, 1853 the Hannoverian Barque Lueneburg drew alongside in New York (Roll 130)! The passengers went on board, at Harburg, Hannover's harbor on the south side of the Elbe River, opposite the gates to the Free and Hanseatic City of Hamburg. In the early 1850s the Kingdom of Hannover sought to share in the rich emigration business of Hamburg (Harburg became Prussian in 1866 and was not incorporated into Hamburg until 1937.). But of course the Germans to America team could never figure out this historical sequence. The book edition, Volume 6, calls this sailing vessel "Leuneburg" and has it departing from Hamburg whereas the CD corrupts the names to "Luremberg," makes the ship set sail from Marseilles and has it arrive any old where on October 25, 1853. The DAD subsumes the book version. All three indexes cause the 182 passengers to journey by way of New York to Germany. The CD and DAD invent an annotation for all of them: "Returnees." But this impossible rednering is by far not the whole story. Paul Winterstein (40) emigrates with his wife Josephine (32) and with his children Barbara (13), Kunigunde (9), Caspar (5) and Ludwig (3). But you can find only his wife and the children in the book, on the CD and in the DAD as passengers on the Leuneburg/Luremberg. Did Paul Winterstein die? Or stay behind? Or had he preceded his family? In the book list, Paul Zettler (40) is entered ahead of Josephine Winterstein, which raises the suspicion which the original for the date of October 25, 1853 unmasks readily as negligence when the passengers Maria Zettler (24) and Paul Winterstein (40) disappear. On the microfilm, however, they are entered correctly and the Wintersteins stay next to each other. The real situation never dawned on the Germans to America team. The book, the CD and the DAD call the ship the Luneberg, and have it arrive on August 10th, but the CD remains incapable of releasing its faith in Marseilles while the book and the DAD stick with Hamburg as the port of departure. Maria Zettler (24) in the original comes from Memmingen, non from Menningen as the Book, the CD and the CAD would claim whereas Paul Winterstein (40) gets turned into Paul Winterflein (40) because the Germans to America team lacked the savvy to cope with the German written form of the "s". Thus we must conclude that anyone who relies on Germans to America, that is on the book edition, on the CD or on the DAD would have a difficult time coming up with the name Paul Winterstein, if Paul can be discovered at all with his job (shoemaker) and his home town (Asch). Who would hit upon the consonant variable "fl", in place of "st?" Who would hit upon "Winterflein" if the two names from the list were not set side by side which might be possible in the book), but where the names are not alphabetical and can not be compared (which might still be possible in the CD). Who would know that in the original Maria Zettler is right before Paul Winterstein and that Paul Zettler (40) therefore is a suspicious entry--a product of Germans to America. Mixtum Compositum: Paul Zettler, invented by GTA and DAD. This Certification includes 7 informations not according with the two National Archives passenger lists. Incorrect are the second name and the ships name, the port of embarkation and the final destination, the occupation and the last residence. And the originals have no purpose for travel and even this phantom passenger did want to return with this phantom ship from Deutschland to Germany, to the country of origin via New York. The Arnold Boninger from Rotterdam to New York with arrival on November 3, 1865 and the Argonaut from Bremen to New York on Nov. 3, 1865 evaporated from between the two book covers. Namely the Germans to America team skipped over the date of November 3rd that year. Thus we are left without a clue to Louis Weik and Friedrich Thiele, for Volume 16 ends with November 2nd and Volume 17 begins with November 4, 1865. The CD and the DAD in this instance come to the rescue because both of these individuals whom descendants have been seeking turn up in their editions. On June 13, 2001 the DAD made a statement to the press that its Germans to America database had now covered the years 1889-1891 and that there were consequently more than four million pieces of data at disposal. For sure, most arrival harbors now appear correctly. But not all the passengers contained in the lists have been included in the volumes. Cospicuous is the period from October 10 to November 1, 1890 because, in the book edition's Volume 59, several days are missing, on which dates according to the Philadelphia Team there were no ships arriving in the harbors. One glance at the microfilms, however, immediately reveals the lie of their research: For indeed 36 ships with German passengers arrived and were not given consideration for German passengers: 26 of them arrived in New York (NAMP, M 237, Rolls 557/558), 5 arrived in Baltimore (M 326, Roll 48) and 5 in Boston (M 277, Roll 113). From among these, 15 ships had been put out to sea in Stettin, Hamburg and Bremerhaven. The DAD accepted these gaps without question. Not one of the missing persons from the passenger lists was reported by DAD: Not the nurse E. Barth on the Richmond Hela (London to New York with arrival on October 10, 1890), not Jakob Bisterfeld and not Hermann Stolpmann on the Polynesia arriving from Stettin to New York on October 10, 1890, and not Gesche Ficken and Minna von Thaden on the Trave traveling from Bremen and Southampton to New York with arrival on October 18, 1890. Nor do they mention Gretchen Becker and Josef Liebl on the Spree from Bremen to Southampton arriving in New York on October 21, 1890. Missing too are Louis Wehmeier and the Haeberle family from Stuttgart on the Lahn coming from Bremen and Southampton to New York on October 25, 1890. Likewise missing are Louisa Kniess on the Anchoria from Glasgow to New York arriving on October 28, 1890 and Abraham Goldstern who arrived on the Moravia from Hamburg to New York on October 29, 1890. Equally absent are Margarethe Franzen with her children Ella and Franz on the Wieland arriving from Hamburg to New York on November 1, 1890. Absent too are Franz Giebel and Gustav Ebel on the Aller reaching New York from Bremen/Southampton on November 1, 1890 nor can we find Johann Sangsbier on the München coming from Bremen to Baltimore on October 11, 1890. The Germans to America book edition and the DAD with its data from the list of the Augusta-Victoria from Hamburg / Southampton to New York arriving on October 11, 1890 once again exhibits the same old traps. Frida Wolters does not come from Lanenburg as the book and the DAD claim but from Lauenburg and Friedrich Lange is not Friedrich Lanze (book edition/DAD) and he does not come from the Prussian nowhere (book) but from Neuenkirchen (DAD). Louis Feuerloh from Stettin has to be Louis Generloh in the book and in the DAD, while Anna Hoffmann (24) likewise from Stettin, can be found nowhere in any of the data bases. Domestic servant Marie Sturm from Bavaria actually boarded the vessel in Southampton even though both editions of the date have her going on board in Bremerhaven. The Ellis Island Immigrant Museum in the spring of 2001 posted the lists of ships that arrived in New York from 1892 to 1924 (http://www.elisislandrecords.org). Accessible without charge, they can be studied in any room where an on-line-computer is available. Thus the DAD as a genealogically valuable data base has been largely corrected or better said, superseded. To be sure only nine data items are included in the Passenger Record (whereas the DAD offers around 40, only in form of an attestation), but all data items are available in the Original Manifest so that the users themselves can correct the mistaken interpretations of the original spellings. And if the person in search of a name clicks on ship he/she can view a photograph of the vessel amplified with historical and ship information. All of which material can be printed out on paper and the ship information including a photograph and a photocopy of the original passenger list can be ordered. The DAD seems to want to mimic Germans to America. In the printout of the DAD attestation the entry for the passenger Kube in the category Compartment reads unknown whereas the entry visible on screen at the DAD computer in Bremerhaven in this category reads Saloon/ 1st class. By contrast, in the Ellis Island database (original of the passenger list) the name Heinrich Kube appears in the list of Steerage Passengers. According to the DAD Kube´s Port of Departure was Cherbourg and his Date of Departure is given as April 27, 1904 (The vessel reached New York on April 31, – a trip that could not be made in 4 days.). 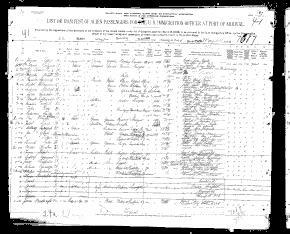 The entries in the Ellis Island database for the passenger Kube read Hamburg for thePort of Departure and the Date of Departure is April 20, 1904. Cherbourg was the third stopover on April 22 after the ship had already taken on bord passengers in Cuxhaven and in Southampton as well (April 21). Kube's Place of Origin and Age are correctly indicated in the DAD (Langen, 28), whereas the Ellis Island 'Passenger Record' gives it incorrectly (Longen, 29). However, since the original passenger lists (Original Manifest) can be accessed, customers can easily identify mistakes in the Passenger Record. The Ellis Island data personnel admit that they make errors and request that customers report these oversights via e-mail. In the Ellis Island list the captain's name of the vessel on which H. Kube traveled to America is given: H. Leithäuser and the (scanned) Affidavit of the Master is presented after every page (along with the name of the doctor on board, Dr. Hormann). In the DAD the captain's name is not indicated. Even though the DAD thinks the company which owns the Moltke is unknown, it is clearly visible in the Ellis Island output that it was the HAPAG (Hamburg Amerika Paket Aktien Gesellschaft). Six incorrect important data of Rudorf Wildemann certified as correct data by the DAD. In Southampton and Cherbourg mainly Americans (which were disregarded in the DAD) boarded the vessel; therefore it is highly unlikely that the 15-year-old worker Rudolf Wildemann from Russia boarded the vessel in Cherbourg and that he traveled in the Saloon/1st class, as stated in the DAD. All the poor people from Eastern Europe bought their tickets from the HAPAG shipping company and boarded the vessel in Hamburg. Why should they travel to far-away Cherbourg to board the vessel? And why should HAPAG check-in their customers at a foreign port and not accommodate and cater for them in their own emigration facilities? A look at the original passenger lists shows that the 15-year-old worker Rudolf Wildemann boarded the vessel in Hamburg and traveled in the steerage. After his arrival in New York he was not allowed to leave Ellis Island until May 2 after he had wired to his father in Middletown/Connecticut (Place given in the original list.). In the DAD the indication Connecticut is omitted so that its customers do not know to which of the 33 Middletown's in the USA Rudolf Wildemann wired. He is listed in the Record of Detained Passengers, Ship: Moltke. He owed the money for breakfast, dinner, supper. His Cause of Detention: to tel. for $. According to the DAD the 15-year-old German-Russian worker who traveled on his own must have been a saloon-idler (i.e. travelled 1st class). If this would have been true he – like all 1st class passengers - would not have had to enter Ellis Island. The DAD has not succeeded in keeping abreast with the Ellis Island Immigrant Museum database. It has been tricked by the authors of Germans to America who charge a small amount for providing information on the period 1850-1888 (CD-ROM). And the Ellis Island database, covering the vessels arriving in New York 1892-1924, has been made available on the internet (so far free of charge). - "Russians to America" 1850 – 1896 (1). An attestation with data is available. Customers are informed that "the search for persons who emigrated outside of these periods cannot be pursued until a later stage". - Ellis Island Immigrant Museum, New York (http://www.ellisislandrecords.org): So far data of arrival passenger lists and informations on vessels reaching New York from all parts of the world in the period 1892 – 1924 are accessible at its site, and photocopies of the originals can be ordered. - Staatsarchiv Hamburg (http://www.hamburg.de/LinktoYourRoots/welcome.htm): Provides data on the period 1850 – 1934. So far data of departure passenger lists and informations on vessels leaving Hamburg in the period 1890 – 1894 are accessible at its site; index 1850 – 1871. - Historic Emigration Office (HEO), Hamburg (http://www.heo-online.de): Provides data on the period 1850 – 1934 and photocopies of the original departure lists can be ordered; index 1850 – 1871. - Die Maus, Bremen (http://www.passagierlisten.de): Provides data on vessels departing from Bremen/Bremerhaven in the period 1920 – 1939. So far the data on 1920 -1923 are accessible at its site. Photocopies of the original departure lists can be ordered. - Forschungsstelle Deutsche Auswanderer in den USA (DAUSA), Oldenburg (http://www.dausa.de): Photocopies of the original arrival passenger lists of vessels reaching US ports in the period 1820-1897 (National Archives Microfilm Publications) can be ordered. The DAUSA provides access to the indices 1820 – 1897 covering these arrivals. Numerous links to related web sites are given. Instead of providing these 5 links the DAD simply points to the Seaside Town of Bremerhaven and to the DAD creator: the Historisches Museum Bremerhaven. "Wenn man es wagt und seinem Vaterland entsagt." Auf Seglern und Dampfschiffen zogen sieben Millionen Deutsche nach Amerika. Zum Problem "Passagierlisten" (zu Glazier / Filby: Germans to America)“, in Frankfurter Rundschau, 48 (1992), October 10, 1992, p. 16. Likewise under the title "Germans to America. 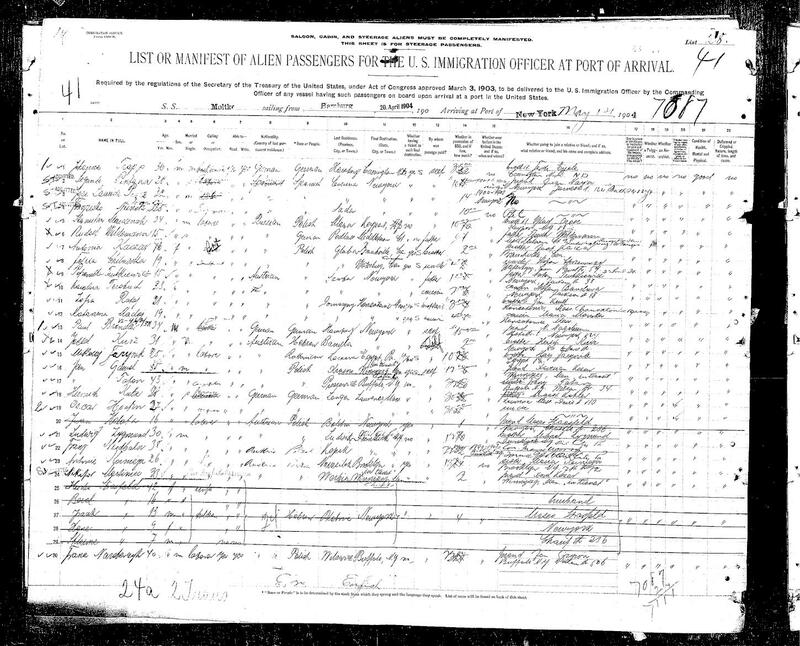 Lists of Passengers Arriving at U. S. Ports. Deutsche nach Amerika: Fallstricke für Genealogen und Historiker“, in Studies in Indiana German Americana, 2 (1995), 88-99. Furthermore, in English "Snares for the Genealogist and the Historian. A Critique", in Society for German American Studies Newsletter, 14 (1993), 3, 19-24. "New Lures to Entrapment for Genealogists and Historians, Vol. 42 of Germans to America: Lists of Passengers Arriving at U. S. Ports, March 1882-May 1882, ed., Glazier / Filby (Wilmington, DE: Scholarly Resources, 1995)”, in Society for German-American Studies Newsletter, 16 (1995), 3, 22 ff..
“Glazier / Filby: Germans to America, Volumes 1-50 (1988-1996). Fallstricke für Genealogen”,. in: Genealogie, 45 (1997), 9-10: 274-280; see also the reprint in Oldenburgische Familienkunde, 39 (1997), 4: 620-629; also in English, "Germans to America, 50 volumes that are not to be Trusted,” in The Palatine Immigrant, 22 (1997), 2: 80-87, and in Der Blumenbaum, 16 (1999), 4: 176-179. "Fallstricke und kein Ende, Volume 54 of Glazier / Filby, ed, Germans to America (Wilmington, DE: Scholarly Resources, 1996): Ein Abgesang”, in Genealogie, 46 (1997), 3-4: 507-508; also in English: "Pitfalls and No End to Them”, in The Palatine Immigrant, 22 (1997), 3: 152 ff. "Noch einmal: “Germans to America” ist wirklich nicht zu trauen”, in Genealogie, 48 (1999), 1-2: 410-413; also in English, "Missing Baltimore Arrivals in Germans to America,” in The Palatine Immigrant, 24 (1998), 1: 21-25, also in Deep South Genealogical Quarterly, 36 (1999), 2: 93-96. “”Germans to America” im Dreierpack: Fallstricke und kein Ende . . .“, in Genealogie, 49 (2000), 11/12: 353-373; 50 (2001), 1/2: 437-447; also in English, ““Germans to America“ in Three Parts: Pitfalls without End . . .”, in Society for German American Studies Newsletter, 22 (2001), 1: 1-6; 2: 10-13; 3: 17-23.